At Valley Center Veterinarian Clinic, we understand that you want what’s best for your pet, and we want to provide that for you. To do that, we offer a wide range of unique veterinary services that take our practice above and beyond. If you’ve been searching the internet for the “the best vet near me,” you can be certain that Valley Center Veterinary Clinic is what you’re looking for. 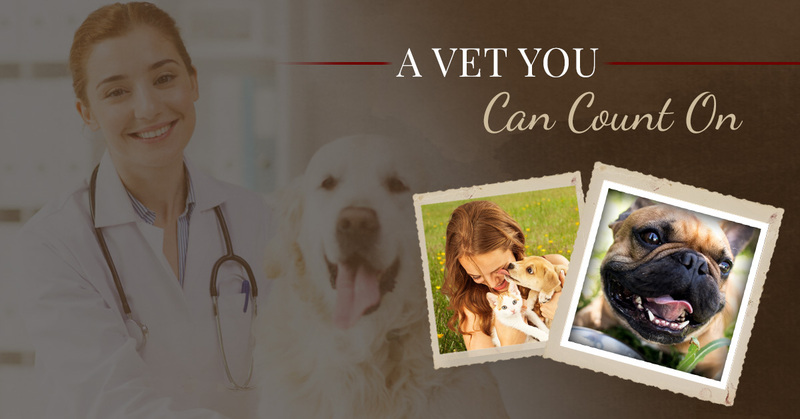 To give you an idea of what makes us the “best vet near me,” we’ve taken some time to outline a few of the services that set us apart from other vets in Valley Center. But first, let’s look at what to look for in a veterinarian. Remember, you have a lot of choices when it comes to a veterinarian to care for your pet, so be sure you are choosing one that meets your needs. Friendly, Caring Staff: Just because your cat or dog is receiving care, doesn’t mean your vet should be rude to you! Secondly, they shouldn’t be judgemental or rude about your pets. Everyone in the exam room wants what is best for the animal. For example, let’s say there is a dog owner who hasn’t taken their pup to the vet for much too long for any number of reasons. If your local vet takes one look at the dog and ridicules its appearance or the fact that the owner hasn’t taken it in for years, then that owner is unlikely to come back, which is not good for the dog. Choose a vet who is going to accept you and your pets with open arms. Your veterinarian should be cool, calm, and collected and understand how to soothe anxious pets. Choose A Vet That Takes Walk-Ins: We never like to imagine harm coming to our animals, but sometimes the unexpected happens. A dog could get hit by a car or a cat could get into something hazardous. If you choose a vet that you know will be there for you and your pet during an emergency down the road, your pet will be in the hands of someone they trust and who knows your pet’s medical background, giving the opportunity for better care. Pick A Vet With Good Reviews: Well, you know we’re well into the 21st century when we use this as a method of picking the “best vet near me,” which we’re sure you’ve searched for online a time or two! Just to ease your mind, Valley Center Veterinarian Clinic has dozens of 5-star reviews across the internet for your consideration. Start by checking out some of our Yelp, and a quick Google search for “Valley Center Veterinary Clinic” is sure to pull up more results! Choose A Vet That Cares About Pets: This may sound absurd, because of course, a veterinarian will care about pets, right? While we hope so, it helps when a veterinary goes above and beyond to help all pets in their region. Valley Center Vet Clinic, for example, offers low-cost vaccines for pets once a month, as well as affordable microchips. The more pups and kittens in town who are vaccinated, the fewer cases of rabies, feline leukemia, DHPP (distemper, hepatitis, parainfluenza, and parvovirus) we see. When we offer “cheap vaccines,” we are really offering pet owners a way to help contribute on an individual level to the overall health of the pet community in Valley Center. We have three amazing and caring veterinarians on staff ready to take care of your pet. Dr. Clarke, our vet clinic owner, has experience with exotic animals and has expanded her skills to include ultrasound and surgical laser skills. Dr. Benson is one of the most compassionate veterinarians you will ever meet, and specializes in dignified home euthanasia services and home hospice care for animals. Last but not least, Dr. Ito specializes in medicine, surgery, neurology, and ophthalmology, as well as emergency vet care. Each of our doctors brings a unique set of skills and specialties to the vet clinic, so you can trust that regardless of the reason you’re coming in, your pet will be in good hands. One of the unique services we offer at Valley Center Veterinary Clinic is house calls. We understand that many people have a hard time getting their animals to the vet. There are several people who can benefit from our veterinary house call services. Originally, this service was created for our elderly neighbors who have trouble getting their large, old, or stubborn dogs to the vet’s office for a checkup. We found that we could help ensure the health of the dogs by visiting them at home for exams and vaccines. However, we also offer this service for cat owners with very nervous or scared cats and for clients who have several animals that need vaccines or dewormers at the same time. Just like we offer house calls for regular exams, we also offer home pet euthanasia services. We understand that euthanizing your pet is difficult – you’re saying goodbye to a friend. This is never easy, but can be less difficult when done in the comfort and privacy of your own home. The last thing you want to do is force your sick or aging pet into the car for a trip the vet’s office, a place where a lot of cats and dogs would rather not go. With home euthanasia, our vets will meet you at your home so you and your pet can have peace in their final moments. This is generally less stressful for both you and your pet as you move through this trying time. We also offer aftercare cremation services for your pet, where they will be treated with dignity throughout the process. We can take paw prints for you, and return the remains in a beautiful wooden urn. Our doctors work very closely with our aftercare company and will handle all arrangements at your request. As your local vet clinic in Valley Center, we try to serve the community in any way we can. One way we do this is by making it as easy as possible for you to come in for a vet visit. So, what better way to do that than to offer walk-in vet visits? We offer walk-ins for emergencies and non-emergencies alike and will do our best to prioritize guests in order of visit and severity of the situation. Situations that would warrant an emergency vet visit include, but are not limited to, severe bleeding or being unable to stop blood flow, choking or difficulty breathing, blood in stool or urine, coughing up blood, eye injuries, inability to move properly (sluggishness or lameness), heat stroke, vomiting or diarrhea that lasts for more than 24 hours, refusal to eat or drink for more than 24 hours, if you suspect they have consumed poison or if there is any other sort of obvious problem causing them pain, unconsciousness, or anxiety. Your pet is like your child, and you would take your kiddo to the doctor for all of the above. At the very least, keep our number in your phone and call us at any time at 760-749-0560 if you have a question about your pet’s condition. Proper oral care for your pup is essential in ensuring that live a long, healthy, and happy life free from any tooth-related complications in the future. There’s a reason your veterinarian will look inside your dog’s mouth when they come to visit. Just like humans, dogs can experience gum disease, loose and rotted teeth, sore gums, and a number of other diseases and painful conditions. While your dog’s breath will never be minty fresh, persistent rank breath that makes you turn your nose away is one of the first signs of an infection. Be sure to schedule a non-anesthetic dog teeth cleaning soon. Ferrets, lizards, guinea pigs, oh my! Just because your pet doesn’t wag its tail and bark doesn’t mean it can’t see a local veterinarian. Our ability and willingness to treat animals that other veterinary practices might turn away or not have the knowledge to treat is just another reason we’re the “best vet near me” that you’re looking for. While a hamster might not seem exotic, most vets do not stray very far beyond cats and dogs — which is probably a good thing. “Exotic” animals, including birds, reptiles, and rodents need vet care from time to time, but not every veterinarian has the expertise to treat them and vets should admit if they cannot help your pet. If we are unable to care for your animal, we will refer you to someone in the area who can. Did you know over half of domestic cats will not regularly visit a vet? Just like dogs, cats need annual vaccines and checkups to ensure that they are staying healthy. While many dogs that come into our practice are quite aloof and just happy to be out of the house, we know that cats have a more difficult time in the car and at the vet clinic. Many cats spend time outdoors and can pick up a number of diseases. Valley Center Vet Clinic is a certified cat-friendly practice, meaning we do everything we can to make your feline friends comfortable. From our calming pheromones in exam rooms to our cat-only areas that are far away from barking dogs, your kitty will be practically begging to come back to our Valley Center vets! While we can use our expertise and experience to help you decide the best path of care for you and your pet, we also know that some pet owners like to take a more natural, yet still effective, approach to animal care. We offer animal reiki, animal acupuncture, and essential oils for pets to treat a wide range of conditions including gastrointestinal problems, anxiety, stress, bladder conditions, urinating outside of the litter box, seizures, bacterial infections, arthritis, hearing loss, kidney disease, and much more. The veterinarians who perform any of these treatments have had extra extensive training to ensure that they are using the best practices to care for your pets. And add, “Make Appointment With The Best Vet Near Me.” Get in touch with us by phone, email, or stop by Valley Center Veterinary Clinic today! Remember, we are here for you and your pup, cat, reptile, bird, pot-belly pig, or other animal companions anytime you need us. We do what we can to be the best vet in Valley Center, and happily take walk-ins as your emergency veterinarian. Please come right over in the event of a pet emergency. Our technicians will assess the nature of the emergency and determine if we can initiate treatment or transfer to a 24 hour medical facility. We can treat the vast majority of emergency cases on-site. With advance notice, we can schedule convenient appointments at your home. We can take the hastle out of the experience by performing pet examinations on your property. This exceptional service was created to assist the elderly with large breed older dogs, owners with very scared cats.